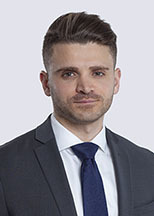 Danny Chami is a corporate attorney who focuses his practice on private equity, mergers and acquisitions (M&A) and general corporate matters. Danny has significant experience in the representation of private equity sponsors, government contractors and jet-service providers in corporate transactions. Beyond M&A, Danny has also represented private startups with respect to corporate governance, fundraising and securities matters.